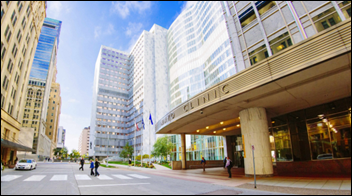 Mayo Clinic goes live on Epic at its Rochester, MN campus as part of a $1.5 billion system-wide software overhaul that will bring all of its facilities onto a single platform. Preparation for the big-bang event on May 5 was so extensive that the local power company created a new substation to power it. Mayo has already implemented Epic at its facilities in Wisconsin and southern Minnesota, and expects to begin deployment at its hospitals in Florida and Arizona after the Rochester implementation is complete. New poll to your right or here: Does connectivity to your EHR make you more or less likely to buy a Fitbit? 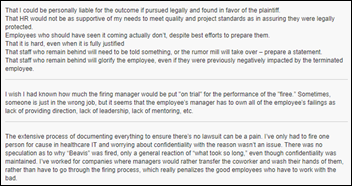 Here are reader responses to “What I Wish I’d Known Before … Firing Someone for Cause.” A lack of support, plus a tendency to tiptoe around tossing bad apples seem to be common themes. I’m hoping Epic employees and others toiling in the Minnesota trenches of the Mayo Clinic will anonymously weigh in on this week’s question. 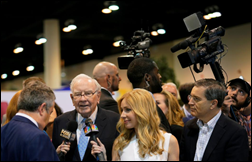 Berkshire Hathaway CEO Warren Buffett reiterates his commitment to the healthcare improvement project his company is launching with JPMorgan and Amazon. At Berkshire’s annual shareholders meeting, he reiterated that all three companies want their 1 million-plus employees to receive better care at lower costs, but didn’t get into specifics. He did mention that a CEO for the new venture will likely be placed within the next two months. TeleTracking promotes Christopher Johnson to president. David Nace, MD (Lantern) joins Innovaccer as CMO. In the UK, the Somerset Partnership NHS Foundation Trust joins TriNetX’s research network. Renown Health selects Phynd to synthesize, transform, and share provider information across its health network in Nevada. In Australia, the Victorian government allocates $124 million to implement Epic at three hospitals. Calvary Hospital (NY) will host their Meditech system on CloudWave’s OpSus Healthcare cloud. Massac Memorial Hospital (IL) selects Parallon Technology Solutions to implement and host its Meditech Expanse software. Holzer Medical Center (OH) will switch from Allscripts to Athenahealth in late May or early June. Kingman Regional Medical Center (AZ) will go live with Meditech supply chain management software in September. Crisp Regional Hospital (GA) will switch from Meditech to Cerner in 2019. New York City-based urgent care chain CityMD will pay $6.6 million to settle a civil fraud lawsuit filed by a whistleblower and the Manhattan US Attorney General’s Office. CityMD, which has 88 facilities, admitted to billing Medicare for procedures that weren’t as lengthy or complex as it claimed. This article suggests that President Trump will meet with National Association of Veterans Affairs Physicians and Dentists President Samuel Spagnolo, MD to discuss his potential nomination for VA Secretary. Spagnolo is also a senior attending physician at the VA Medical Center in Washington, DC and a professor of medicine at George Washington University. He has served in numerous positions within the VA throughout his career. 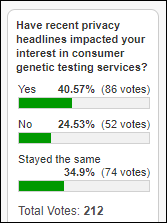 The majority of respondents in a Reaction Data survey of 145 believe that Anthem’s decision to stop covering ER visits it deems unnecessary will have a negative impact on their organizations and patients, especially when it comes to out-of-pocket patient expenses and restricted clinical care. The New York State Psychiatric Association endorses DrFirst medication management tools for use by the psychiatric community in New York State. Mobile Heartbeat will present at the 2018 ANIA Conference May 12 in Orlando. Liaison Technologies is accepting applications for its fall semester 2018 Data-Inspired Future Scholarship. Meditech, PatientSafe Solutions, and PerfectServe will exhibit at the 2018 ANIA Annual Conference May 10-12 in Orlando. The National Council for Behavioral Health awards Netsmart the 2018 Mental Health First Aid Business Leadership Award. Clinical Computer Systems, developer of the Obix Perinatal Data System, will exhibit at the Allscripts Client Experience May 8-9 in Saskatchewan. OmniSys, Experian Health, and Surescripts will exhibit at the NCPDP Annual Technology & Business Conference May 7-9 in Scottsdale, AZ. Qventus and TriNetX exhibits at the HLTH 2018 conference through May 9 in Las Vegas. T-System partners with Precision Practice Management to develop the Complete Care clinical and business solution for urgent care providers. T-System exhibits at the 2018 UCAOA Urgent Care Convention & Expo through May 9 in Las Vegas. Heather Russell joins TransUnion as chief legal officer. Wellsoft will exhibit at the Annual Rural Health Conference May 8-11 in New Orleans. WiserTogether partners with digital health marketplace ZendyHealth. The local news profiles ZappRx. Consulting Magazine includes Impact Advisors VP Keith MacDonald in its list of top 25 advisors of 2018. Am I the only person that finds Mayo’s spend for Epic beyond ridiculous? It seems that they could have spent a lot less considering their footprint. I must have missed something. Can you shed any additional light on this project and if the spend matches the need? Not if you look at in terms of all the money /time they wasted over the last 20 yrs trying to build their own system, having IBM build one, etc. That makes 1.5 billion look like chump change!